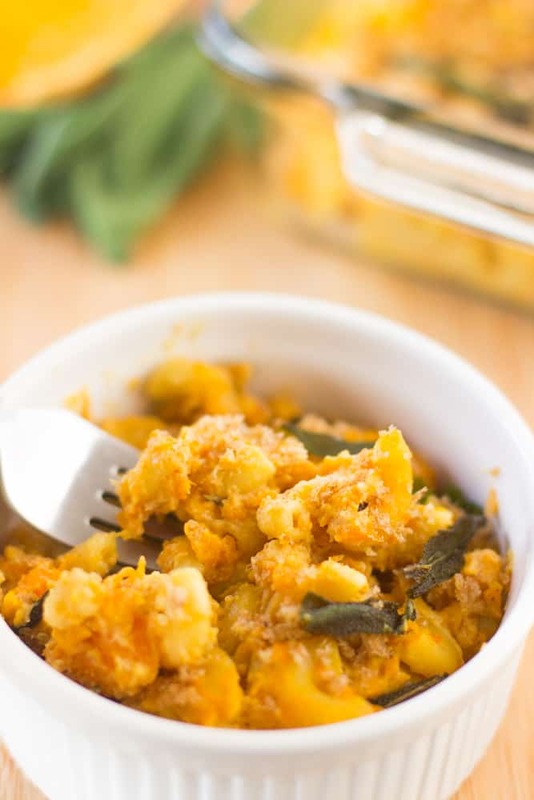 Vegan Butternut Squash Mac and Cheese is a deliciously sweet take on a macaroni and cheese casserole that is vegan, gluten free and so creamy! I’m kind of in love with butternut squash. Like, really in love. Top five reasons: they last forever (they can last from 1-3 months), they are super easy to cut and peel, and you can totally watch Devil Wears Prada for the 5th time without missing a beat, it’s even creamier than pumpkin (whaaat) and it’s sweet. SWEET. How can I not be on that? 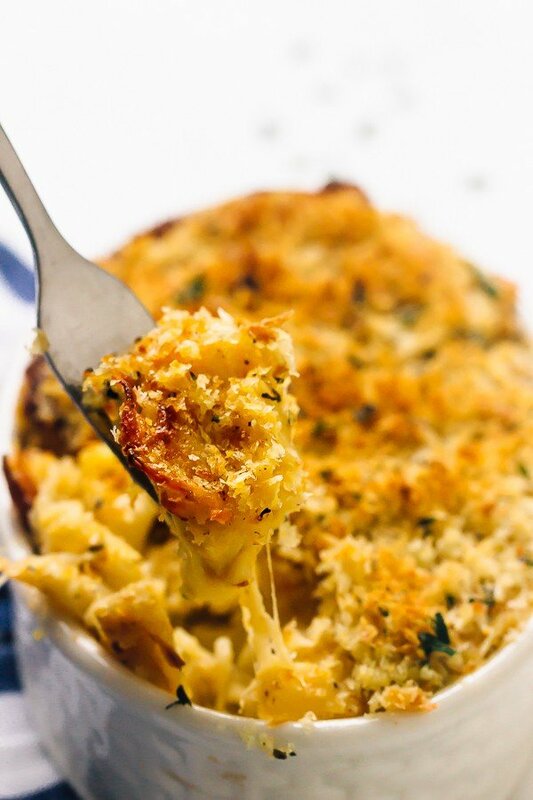 So my friends, with the salty crispy sage on top fulfilling your salty needs, I bring you a mac and cheese that’ll make your dessert get afraid because you’ve just satisfied your sweet and salty cravings in one dish. Let’s go. I think we’ve all seen a butternut squash mac and cheese dish somewhere and been curious as to what it would taste like. Well, I’m here to tell you that it’s pretty amazing. This baby needs NO cheese. None, and you’re in creamy heaven. I know that I call my food my babies and it’s weird. Just stay with me here until the end. First, we crisp up the sage. The sage that transforms into a salty treat on its own that I had to literally restrain myself from finishing before the mac and cheese was finished. In a little coconut oil or vegan butter, crisped up, then on a paper towel. Add a teensy bit of salt and pepper to it to help bring out the flavours. Next, we boil the butternut squash. Peel it, cut it into large chunks, then boil. Boil your pasta simultaneously in another pot. While it’s boiling, we prepare our little sauce of almond milk, coconut flour and some seasoning. Thicken it up, then add the butternut squash and get this – mash it with your wooden spoon or spatula fork. It’s that soft you don’t need any kind of other equipment for this recipe. Add your pasta, top with some gluten free crumbs, then bake this off for a couple minutes so everything comes together. I know the directions may seem like a lot, but I promise it isn’t difficult, it just requires a bit of concentration (please don’t watch Devil Wears Prada while you’re crisping the sage, for e.g., but have on in background). 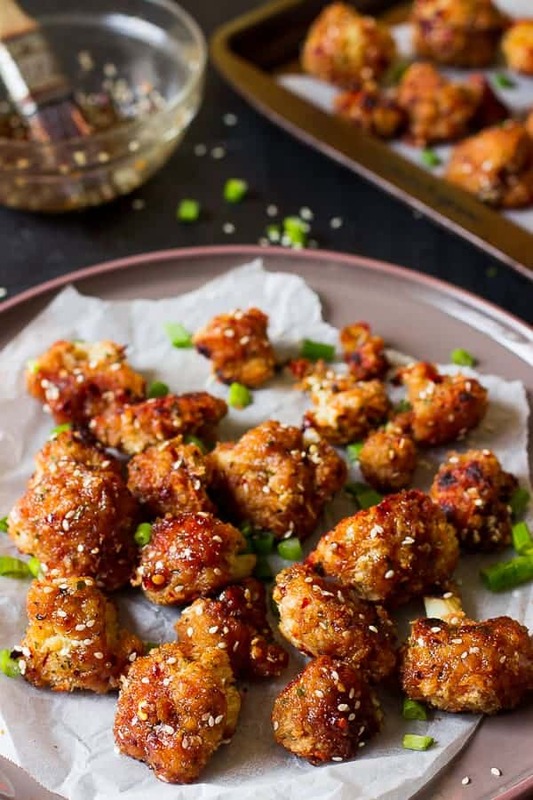 This recipe is 35 minutes long plus a little extra time if you may have gasped again at the same scenes of Devil Wears Prada that you always gasp at, but I promise it’s nothing taxing. The beauty is that many dishes are being prepared at the same time without you actively doing anything to it. I definitely love the contrast of the sage with the butternut squash and would highly recommend that you add the sage on top. You can add as much as you want, or steal bits from others and put into your serving like I did. Creamy, deliciousness. Okay, my vocabulary is officially at rock bottom by this point so I’m just going to let you enjoy this dish. Perfect for these fall nights we are having!! Happy Friday y’all! Preheat the oven to 425°F. Bring two pots of salted water to a boil. Add the butternut squash to one, cook for 10 minutes or until fork soft. Add the pasta to the other (cook pasta according to directions on the box). If it's finished cooking before you have finished the sauce, removed from heat, drain, keeping 1/2 cup pasta water and let stand until you're ready to use it. In a large pan, melt the vegan butter or coconut oil on medium-high. Add the sage leaves and cook for 1 minute, watching carefully so the butter/oil doesn't burn, until crispy. Transfer to a paper-towel-lined plate, and season with a pinch of salt and 1/4 teaspoon ground black pepper. Don't throw out the butter/oil! In the same pan over medium heat with the leftover butter/oil, add the coconut flour and whisk, then cook for about 1 minute until it comes together. Add almond milk and whisk until it is lump free. Reduce the heat to low and season with the 1/4 teaspoon salt and 1/4 teaspoon ground black pepper. Simmer for 2 to 3 minutes, stirring until the sauce starts to thicken, then remove from heat. Transfer butternut squash into the sauce and using a fork, mash it into the sauce until combined. Transfer the drained penne, reserved pasta water, and nutritional yeast squash and sauce mixture. Stir until well combined. Transfer the pasta mixture into a greased baking dish. Combine the breadcrumbs and olive oil to moisten them, then season them with remaining salt and pepper. Sprinkle the moistened crumbs in a single layer over the dish. Bake 5 to 7 minutes, or until golden brown and bubbly. Crumble the crispy sage over the top. Enjoy! If you try this Butternut Squash Mac and Cheese please let me know in the comment section below, or tag me on instagram with the hashtag #jessicainthekitchen! For more exclusive recipes follow me on Instagram AND on Snapchat: jessinkitchen. 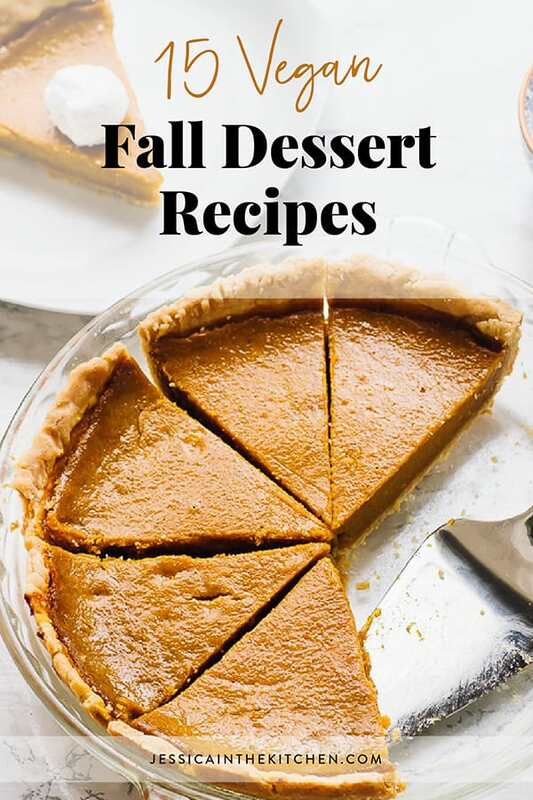 Oh wow…I just made a pumpkin version of this and of course I knew something was missing – I should have fried the sage!! 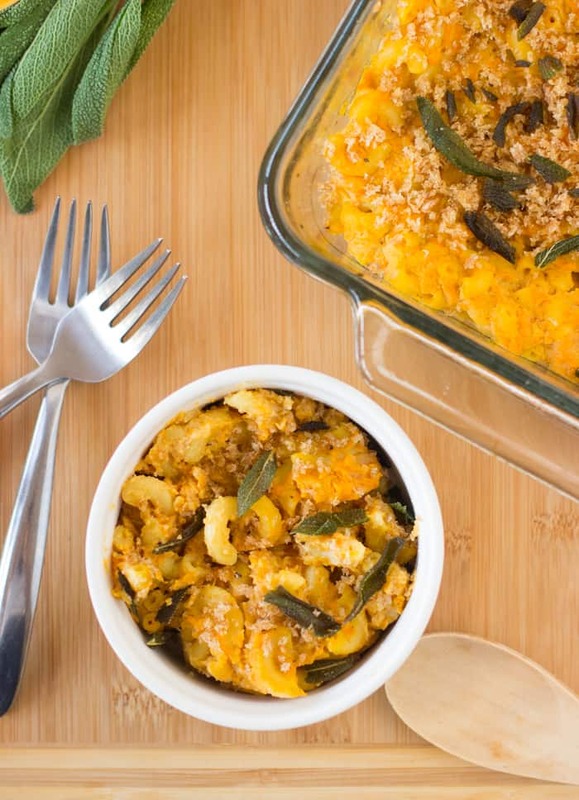 Butternut squash mac and cheese is like the BEST thing ever! It was always one of my go to meals for fall that’s healthy! This version with the sage leaves looks AWESOME! Hand me a fork and a bowl because I am totally going after this one! YUM! love the butternut squash and the sage here. . almost makes up for the fact that there’s no cheese! 🙂 love this! Oooh. I’m inviting myself for dinner. Which is only a liiiitle wierd. Since we don’t know each other and all. I agree; I’m starting to hoard squash and just love knowing it will last weeks in the pantry and there’s no pressure but always reassuringly there! : ) Your mac and cheese looks sensational! I always leave here hungry! Butternut squash mac ‘n cheese sounds delicious, Jessica! I just made a pumpkin kind, so I definitely have to try this version out. So perfect for the fall. Pinned! What a beautiful dish! I do a version of mac and cheese that uses butternut squash or pumpkin to cut the cheese down to about half, but I haven’t done a version with no cheese at all. This looks so good and comforting and that panko topping is just dying to be picked off. Mmmm! Thanks for the recipe! This looks soooo good. Love that crispy sage! 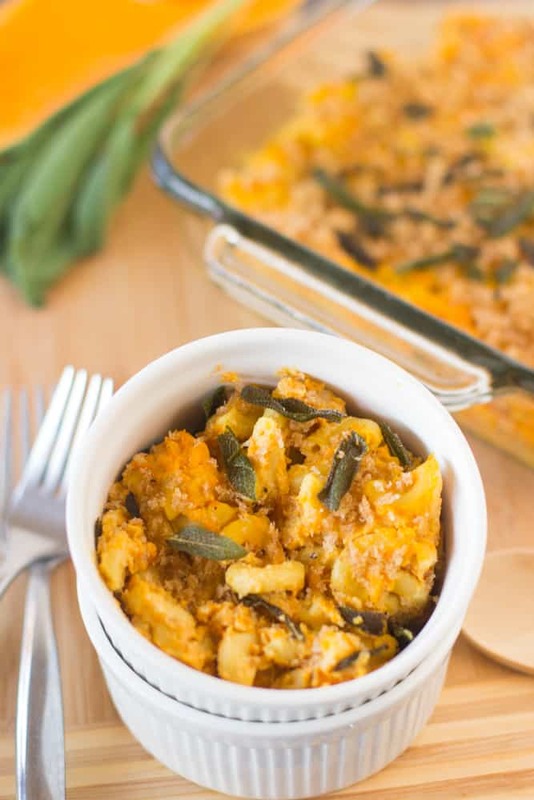 Can’t get enough of winter squashes these days…this veganized mac and cheese looks droolworthy, Jessica. This is beautiful, Jessica! I’m always looking for more ways to get squash into our diets and this sounds like the perfect way. Especially with the addition of the sage, love it! Girl this mac and cheese looks way way way too good! I am seeing so many butternut squash pasta recipes! This one looks especially healthy and delicious! Jessica!!! finally back from my wedding/honeymoon and I have to say, I absolutely love what you’ve done with the blog!!! each recipe looks more inspiring than the next, I can’t wait to gobble them all up!!! looks like you made the right choice, congrats babe! Just made this tonight. 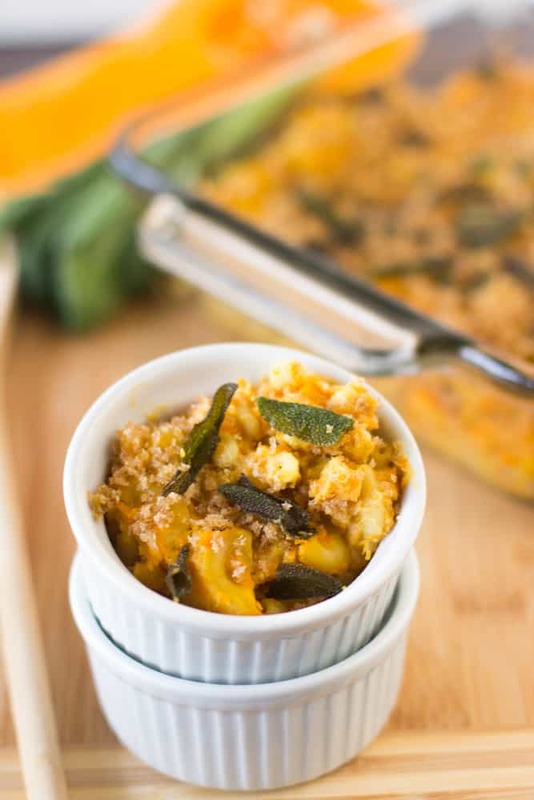 Love the idea of butternut squash as the base of this “Mac N Cheese”. I’m not sure if I had enough butternut squash because it was a little dry, but it was very delicious. My squash did look a medium size one but there were many sizes at my market. Maybe you can edit the recipe by stating the amount of butternut squash you needed, i.e. 1 Cup. Thanks! I made mine with half a butternut squash and it turned out perfectly fine. Maybe you didn’t use enough almond milk. 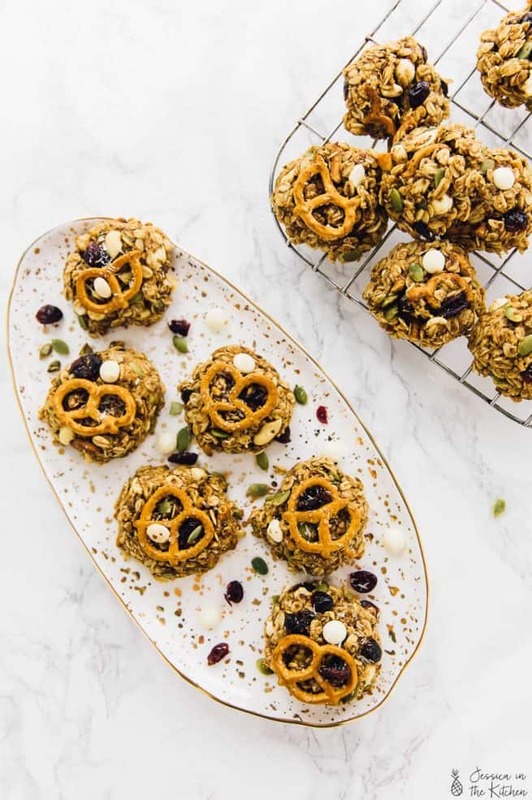 I am excited to try this recipe for a party today! I plan on doubling it and was hoping to bake it in a crockpot instead of the oven. Would you have any suggestions on how long and temp for using a crockpot?